The next instalment of our Dezeen x MINI Living video series explores an experimental apartment by Swedish firm White Arkitekter, which can be reconfigured according to the needs of its residents. Called Drömlägenheten, which means "dream home" in Swedish, the prototype apartment in Linköping, Sweden, features interior walls that can be moved into different positions. 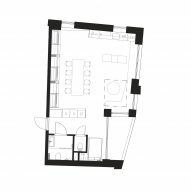 This allows its central space to be used as a living and dining area, as a kitchen or as bedrooms – depending on what is required by residents. White Arkitekter describes the home as a "universal dwelling concept" that could house a variety of potential residents with differing needs, from a group of house-sharing singles to a family with children. The 55-square-metre apartment centres around a large open-plan space, with kitchen and sofa units running along two walls, as well as space for furniture including a dining table and chairs. Partitions hang from runners in the ceiling on one side of the room, which can be pulled out to create three small bedrooms along one side. These rooms are separated by sound-absorbing blinds, with single beds and desks that can be folded out from the walls. There is also a double bed hidden in the ceiling of the main room, which can be lowered to turn the remaining living space into a master bedroom. The kitchen features fold-away work surfaces to make the most of the available space, while under-floor storage units provide space for the foldable dining table, chairs and other items. Other space-saving features include a cavity for bicycle storage in the hallway ceiling, and a laundry room featuring a slatted floor that can be lifted up to reveal a sunken bathtub. The movie is part of Dezeen x MINI Living Initiative, a year-long collaboration with MINI exploring how architecture and design can contribute to a brighter urban future through a series of videos and talks.